George Fraser Kerr was born in Deseronto on June 8th, 1895, the son of John James Kerr and Isabella (née Fraser). By 1901 the family had moved to Napanee and in 1911 they were living in Galt. When Kerr enlisted on this day in 1914, they were living at 135 Tyndall Avenue in Toronto and George was working as a chemist. 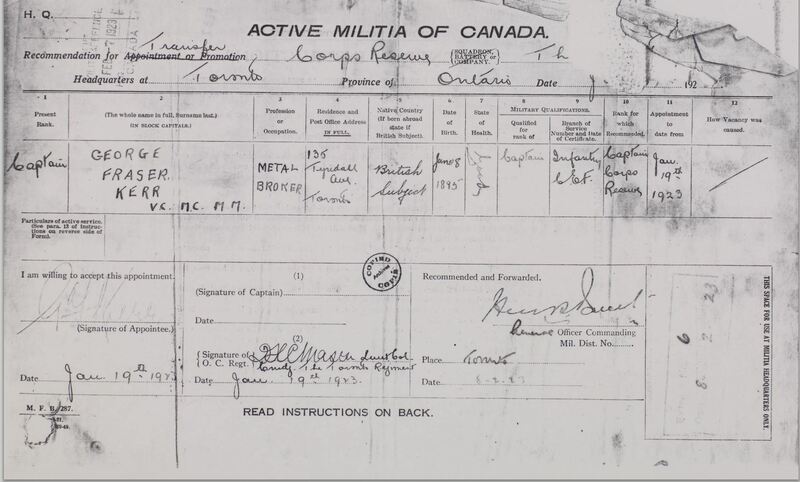 He joined the 3rd Battalion of the Canadian Expeditionary Force in Valcartier, with the regimental number 9570. After this event, Kerr was appointed Acting Sergeant on June 18th, 1916. Kerr was one of four 3rd Battalion men wounded on July 28th in the trenches near Ypres. He received shrapnel injuries to his right wrist and left thigh and ankle and was sent back to England to recover. He remained in hospital until December 12th, when he was discharged to the 12th Reserve Battalion at Hastings, Sussex. For conspicuous gallantry and devotion to duty. When leading his platoon to the jumping-off line he found a gap, which he filled, putting an enemy machine-gun nest out of action, killing about thirty and capturing a battery of 77 m.m. guns. At the jumping-off line he found one company had not arrived, so he led his platoon into its place, with the advancing waves. He was then wounded, but continued to the final objective, clearing out another machine gun nest of two guns on the way. The next two days he continued in the line doing splendid work, and refusing to leave owing to shortage of officers. Kerr’s medals are held at the Canadian Museum of History. George Fraser Kerr ended the war with the rank of Captain. On January 3rd, 1919 the horse he was riding in Lind, Germany shied into a tree, causing George to fracture his right arm. He was treated in hospital in England and then sent home to Canada on May 23rd on the SS Megantic. 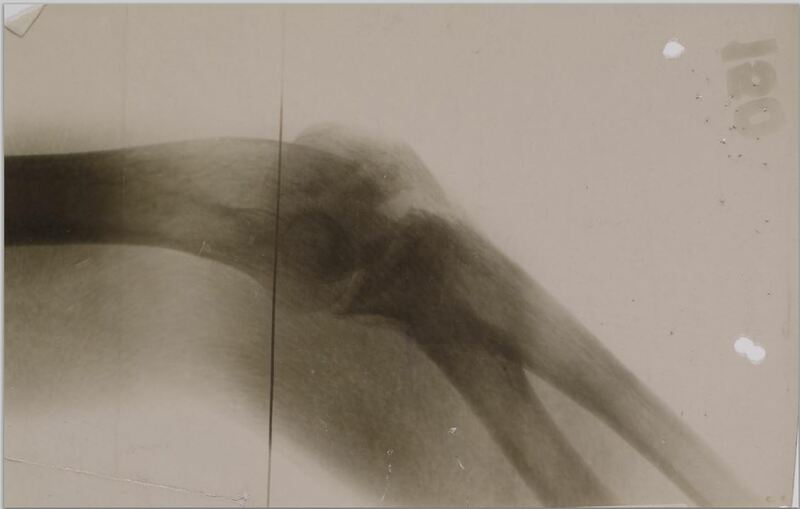 The fingers of his right hand had already been damaged by the shrapnel wound he received in 1916 and now his right elbow had a limited range of movement. He was discharged from the army as medically unfit for further service as a result of his injuries on July 16th, 1919 in Toronto. In 1923 George was appointed as a Captain in the Militia. He was working as a metal broker at the time. Kerr married Mary Beeman on March 16th, 1924 in Toronto and the couple had two daughters. George died of carbon monoxide poisoning on December 8th, 1929 and was buried in Mount Pleasant Cemetery, Toronto.